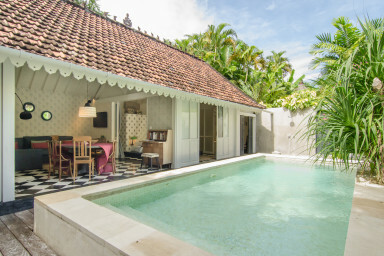 Serene 1 bedroom walking distance to Seminyak famous hot-spots, Villa Pulau 2 exudes the European-style design from its open living area to the elegant setting bathtub with Black & White texture to complete this romantic vacation rental. While the living and kitchen area are set with soothing colors that bring out playful yet serene vibes to complete your unique stay in this lovely villa. Perfect for couple or solo adventurer.